1. Mix ginger garlic paste, garam masala powder and turmeric powder in a bowl. 2. Add the chicken pieces and mix. 3. Add corn flour, salt and little curd. 4. Mix well till the chicken pieces are coated nicely. 5. If desired, add 1 tsp of lemon juice and mix. 6. Keep the bowl in the fridge for 30 to 45 minutes. 8. Add the chicken pieces and fry for 2 minutes or till golden and crisp. Keep aside. 9. In a separate pan, heat oil over medium flame. 10. Add green chillies, mustard seeds and onions. 11. Saute for 2 minutes and add tomato puree, red chilli powder and reduce flame. 12. Stir-fry for 10 to 15 minutes. 13. Add red chilli powder and simmer for a minute or two. 14. Now add the fried chicken pieces and mix well. 16. Transfer to a serving bowl. Tip: If you want more gravy, add a cup of water or more. 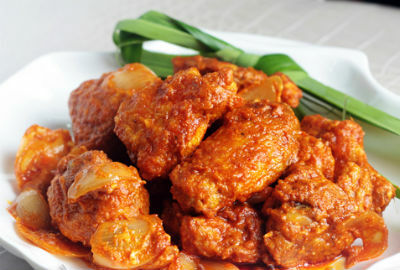 Feel free to comment or share your thoughts on this Singapore Chicken Sambal Recipe from Awesome Cuisine.